Crawl spaces and attics in our homes are dark and damp places which often become the permanent address for pests and rodents. The idea of paying a visit to these places is not thrilling, but as many good Atlanta electrical contractors would be quick to point out, the majority of electrical problems in many homes have their origin in these spaces. Electrical problems commonly surface after a remodeling project, so if you have taken advantage of the new government policy on tax benefits on home remodeling and have been experiencing electrical problems ever since, now is the time to pick up a flashlight and examine your neglected attics, for there is a good chance that your electrical system may be affected. Inexperienced electricians often splice or cut electrical lines and will make splices without even using a junction box and cover. They think that no one will ever crawl into these spaces and know what they have left behind. 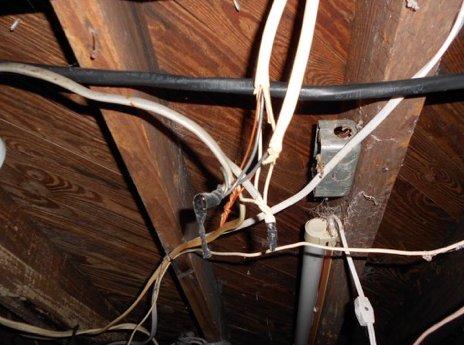 As a result, these improper connections will lay exposed in attics and can cause a lot of problems. Open wire splices found in your home attic during the inspection could add a further dent to your bank accounts. If the term ‘open wiring splice’ sounds Greek to you, then in simple terms, a splice is a connection that is made between two wires. Splices are usually made using small plastic devices that look like a thimble and are known as wire nuts. These splices are twisted onto the electrical wires for making a secure connection. As per the national electrical codes, these splices should be placed inside a covered electric box made of plastic or metal. Wires should be placed inside a covered box because if the connecting wires become overloaded or loose, they can get heated and cause sparks. If you allow these wires to stay in the open, the sparks could cause a fire. Open wiring splices are a recipe for disaster and should be corrected immediately after the problem has been discovered. If your attic has open wiring splices then contact an experienced electrical contractor in Atlanta to quickly rectify the problem. PrevPreviousAre Battery Powered Smoke Detectors Enough?